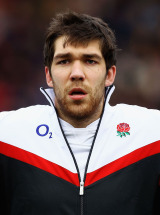 The towering second-row spent three years with Wolverhampton Wanderers FC at Molineux - once playing against Manchester United at youth level - before opting to join Worcester Warriors, where he progressed through the ranks from the age of 14. He played for North Midlands and England at Under 16 and 18 levels and eventually turned out 72 times for the Warriors. He became a regular in the England Saxons setup in the 2010-11 season, appearing against Italy 'A', Irish Wolfhounds and the USA, crossing the whitewash in the third match at Franklin's Gardens. In June 2011, Kitchener announced he would join Leicester Tigers for the 2011-12 season. Kitchener made seven Premiership appearances for the Tigers in the 2011-12 season and was called into the England squad for their tour of South Africa.